A metaphorical ocean journey, Life Of Pi is a visual delight but an intellectual stretch. Ang Lee's adaptation of Yann Martel's novel is a feast for the eyes, although the narrative remains limited in its impact. In Montreal, a man nicknamed Pi (Irrfan Khan) recounts his story to a visiting writer (Rafe Spall). Pi grew up in coastal town in India, where his dad ran a zoo with a Bengali tiger called Richard Parker as one of the main attractions. Intellectually curious as a child, Pi explores a variety of religions and simultaneously called himself a Hindu, a Christian and and Muslim. At 15 years old, Pi (Suraj Sharma) is just beginning to develop an adolescent crush on an attractive local girl when his family decides to immigrate to Canada. On board a Japanese boat on the long journey across the Pacific, with all the zoo animals also making the trip below deck, Pi and his family meet the uncouth cook (Gerard Depardieu). The boat then hits a fierce storm, capsizes and sinks. Pi is the only survivor, and finds himself adrift in a lifeboat with four of the zoo animals for company: a zebra, a hyena, an orangutan, and the tiger Richard Parker. Through a series of violent skirmishes among the animals, Richard Parker emerges as the victor. Pi has to find a way to survive in a small boat on the open ocean with a hungry, untamed tiger for company. For all the self-proclaimed pretension that this is story proving the existence of God, Life Of Pi is a rather long-winded fairytale about a teenager surviving in a lifeboat with a wild animal. Pi's denouement eventually hints that the experience may represent alternative, more mundane events, but further divine or metaphysical interpretations are more difficult to discern. Beyond the message that life's unlikely challenges are there to be conquered, Life Of Pi is an unlikely fable of survival that walks dangerously close to the line where importance is assumed and distinction bestowed, but neither are actually present in a meaningful context. Pluralism serves survival? Any belief is a good belief? The physical and the metaphysical are equally applicable? Better to teach through allegories than the harsh truth? 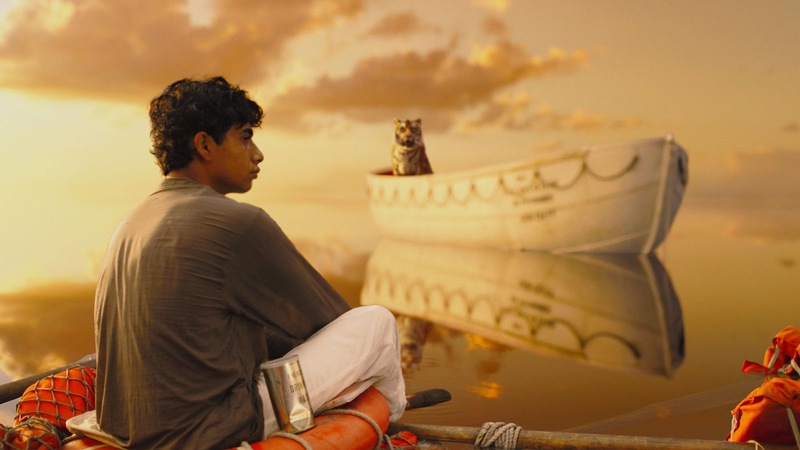 Choose your quasi-spiritual theme and there is fodder for debate in Life Of Pi, but the tiger in a boat does not necessary lend value in any useful direction. With a physically constrained and logically questionable story to tell, Lee does brilliantly in creating an elaborate sensory experience. Gently deploying 3D in masterful doses to add depth and texture, Lee produces a series of exquisite seascapes. He reveals the rich ocean life through movement, light and colour, introducing at key intervals whales, flying fish, jelly fish, dolphins and sharks (or, more accurately, shark fins) as companions, challenges and opportunities to enhance Pi's long journey. 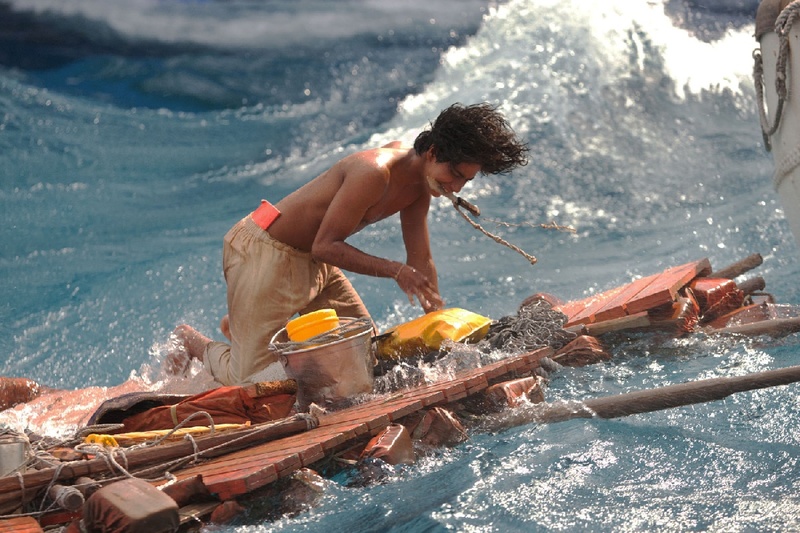 Life Of Pi is also a special effects showcase, from the authentic-looking wild animals on the boat to the ferocious ocean storms, the film is a demonstration of the state of the art in 3D make-believe technology, and Sharma's interaction with the virtual elements is flawless. Sharma's performance is reminiscent of Tom Hanks in Cast Away (2000), one isolated actor persuasively carrying the weight of a movie in a primordial battle for survival against nature. Life Of Pi sails into interesting winds, but the beauty of the portrait is more impressive than any transcendent allusions pretending to be hidden among the tiger stripes.